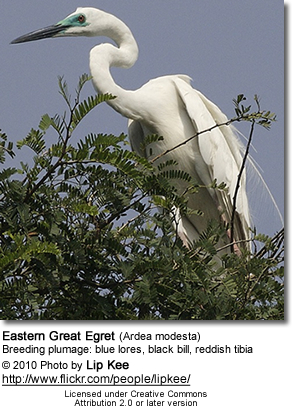 The Eastern Great Egret (Ardea modesta) is a white heron of the genus Ardea. 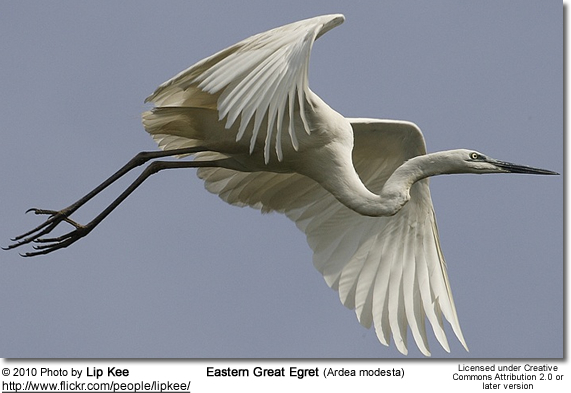 Previously considered a subspecies of the Great Egret (A. alba), it was raised to full species status in 2005. In New Zealand, where it is known as the kōtuku, the Eastern Great Egret is highly endangered, with only one breeding site at Okarito Lagoon. The species is protected in Australia under the National Parks and Wildlife Act 1974. 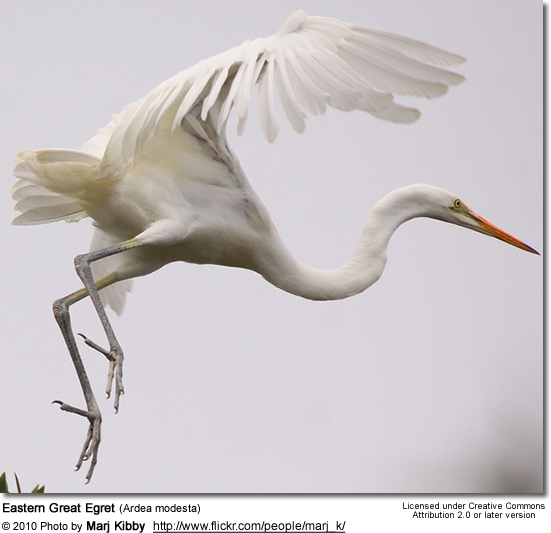 The Eastern Great Egret was first described by British Ornithologist John Edward Gray in 1831, but was for many years considered to be a subspecies of the Great Egret A. alba. Measuring 83–103 cm (33–41 in) in length and weighing 0.7–1.2 kg (1.5-2.6 lb), the Eastern Great Egret is a large heron with all-white plumage. Its bill is yellow in the breeding season and black at other times, and its long legs are red or black. The colors of the bare parts change during the breeding season. The breeding plumage is also marked by long neck plumes and a green facial area. The Eastern Great Egret can be distinguished from other white egrets and herons in Asia and Australia by its very long neck, one and a half times as long as its own body. 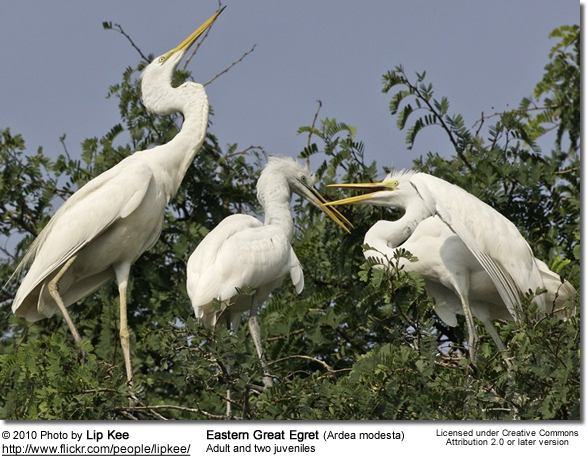 The Eastern Great Egret has a wide distribution throughout Asia and Oceania, with breeding populations in Pakistan, India, Sri Lanka, Bangladesh, Burma, Thailand, China, Korea, north-eastern Russia, Japan, Indochina, Indonesia, Papua New Guinea, the Solomon Islands, Australia, and New Zealand. 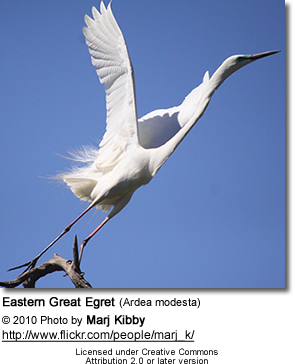 The egret breeds across Australia but only rarely in the southwest of the continent or dry interior. The largest colonies within Australia are in the Top End and Channel Country, which can number several thousand pairs. Colonies in the southeast of Australia can number several hundred pairs. The bird is an uncommon autumn and winter visitor to Tasmania. The diet includes vertebrates such as fish, frogs, lizards, snakes, small birds and mammals, and invertebrates such as insects, crustaceans, and mollusks. 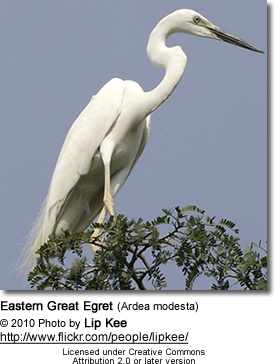 The Eastern Great Egret hunts by wading or standing still in shallow water and 'spearing' prey with its bill. 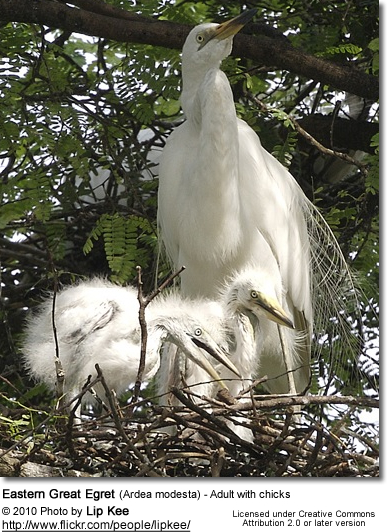 The Eastern Great Egret often breeds in colonies with other herons, egrets, cormorants, spoonbills or ibises. One brood is raised a year, although the breeding season varies within Australia. In the north of the country it is in March to May, in southern and central Queensland December and January, and October to December in the south. Located atop trees at a height of 20 m (60 ft) or more, the nest is a flat wide platform of dry branches and sticks with a shallow basin for eggs and young. The clutch consists of anywhere from two to six pale blue-green eggs, with three or four being the usual number. They are oval in shape and measure 52 mm x 36 mm. The Eastern Great Egret is featured on the reverse side of a New Zealand $2 coin. 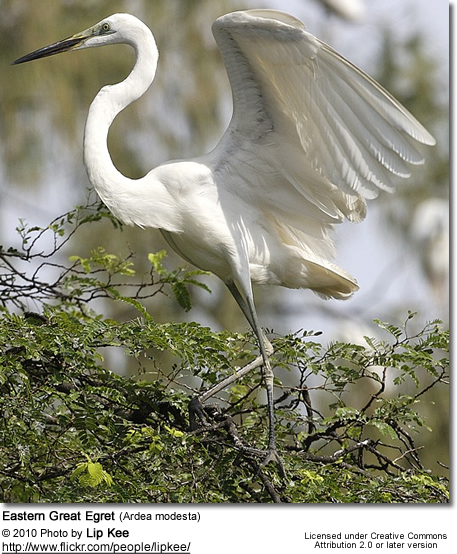 "Ardea modesta - Eastern Great Egret". Species Profile and Threats Database. Canberra: Department of the Environment, Water, Heritage and the Arts, Commonwealth of Australia. February 12, 2010. http://www.environment.gov.au/cgi-bin/sprat/public/publicspecies.pl?taxon_id=1004. Retrieved June 11, 2010. Beruldsen, Gordon (2003). Australian Birds: Their Nests and Eggs. Kenmore Hills, Qld: self. p. 184. ISBN 0-646-42798-9. Watts, Dave (2006) . Field Guide to Tasmanian Birds (2nd ed.). Frenchs Forest, NSW: New Holland Press. p. 48. ISBN 1-876334-60-6.